Do you really want to exploit a tragedy or death for your marketing? 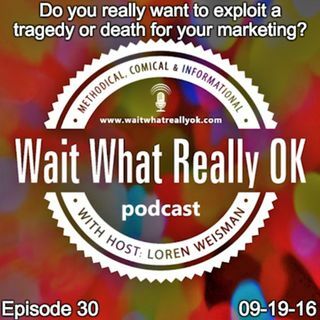 Wait What Really OK Podcast Episode 30 hosted by Brand Precision Marketing Strategist and Counselor, Loren Weisman, digs in to an opinion and view on the idea of exploitation of tragedies, deaths and the negatives that surround that kind of selfish marketing. After two recent and very terrible experiences with the online marketing of a local Vero Beach Radio show Host and Real Estate agent, Loren talks about how ... Más informaciones not everything needs to be marketed and branded. Showing a respect to an event, a death, tragedy or an accident with honor and consideration can do so much more for a brand than trying to exploit it. Taking a road of either saying nothing on a business page or taking the business out of a post highlights the best type of person and the best type of business. Podcast Blog Supplement for Episode 30 of the Wait What Really OK Podcast with Loren Weisman. Podcast Link Supplement for Episode 30 of the Wait What Really OK Podcast with Loren Weisman. Best way to respect a death of a stranger, legend or hero online. Podcast Video Supplement for Episode 30 of the Wait What Really OK Podcast with Loren Weisman. Podcast Photo Supplement for Episode 30 of the Wait What Really OK Podcast with Loren Weisman.